Next Cleanup Date: Saturday, May 5 at noon: Meet at the Shelley Lake Park parking lot, near the Sertoma Park Art's Center building We expect the cleanup to take approximately 2 hours. 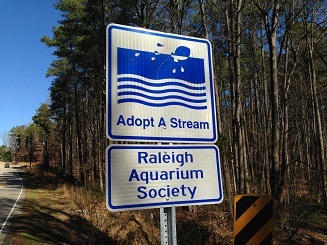 Since 2013, RAS has been a participant in Raleigh's Adopt-A-Stream Volunteer Program. Twice yearly, RAS cleans up a local city waterway. We've adopted Lead Mine Creek in north Raleigh, near Shelley Lake Park, where we have our annual summer picnic. Most maps refer to "Mine Creek", but the section adopted by RAS was named "Lead Mine Creek" by the City Stormwater department. RAS is responsible for the section beginning at "Doctor's Pond" (named "Lead Mine Lake" on the map) near Kroger in the Hidden Valley/Valley Estates neighborhood down to Shelly Lake. The entire stretch runs about 2 miles. The creek is one of two year-round running streams that feed Shelly Lake continuously (albeit the smaller of the two). Shelly has a dozen tributaries, but only two have water (and hence aquatic critters) in them year round. If you are interested in participating, please contact Michael Maieli [michaelmaieli at aol.com].